UTair Ukraine (part of Russia’s UTair Group) will exchange hands before year-end: its new owner will be Anex Tour, an international tour operator. In effect, the subject of this transaction will be the Ukrainian subsidiary’s air operator certificate (AOC), since its entire fleet de facto belongs to Anex Tour, and is managed and operated by UTair, Anex Tour co-owner Serkhat Kochkar told Forbes Ukraine. According to the Ukrainian aviation authority, the airline operates three Boeing 737-800s (tail numbers UR-UTP, UR-UTQ and UR-UTR). The agency also identifies International Lease Finance Corporation (ILFC) as the owner of the airplanes. After the transaction has been closed, the airline will change its name to Azur Air Ukraine. There is the Russian airline Katekavia, also a UTair subsidiary, which operates charter flights for Anex Tour under the Azur Air brand. Its fleet is managed and serviced by Anex Tour’s sister company Mavigok Aviation (MGA). Both are part of Antalya, Turkey-registered Anex Tourism Group. Similarly to Azur Air, Azur Air Ukraine will focus on the charter market. It expects to fly to popular leisure destinations in Turkey, Egypt, Spain, Bulgaria, Greece, and Italy. There are no immediate fleet expansion plans. 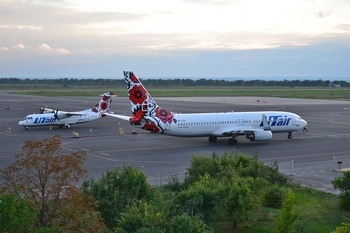 The original airline, UTair Ukraine, was a regional carrier operating domestic flights within Ukraine. However, the airline’s top manager Anatoly Benza announced in November 2014 that the company would drop that business model due to high costs, concentrating on charter flights instead. One of the probable factors that complicated the airline’s business was the stiffening of the state policy on Ukraine-registered subsidiaries of foreign operators. Until last year, the airline’s fleet also included a Boeing 737-500, three Bombardier CRJ200s, and five ATR 72s (the latter have since been returned to the OEM).